In a statement posted to Facebook today, Egyptian army spokesman Ahmed Ali announced that recent operations by Egyptian security forces in the Sinai Peninsula have led to the deaths of 78 militants. Thirty-two of those killed were said to be non-Egyptians. Ali stated that in addition to the 78 killed, another 203 have been arrested. Authorities have also successfully destroyed over 340 smuggling tunnels between Egypt and Gaza, the spokesman claimed. Ali’s statement did not provide much detail regarding the claim that some of those arrested, killed, or injured were non-Egyptians. Reports over the past year have suggested that foreign jihadists with ties to Yemen, Somalia, Algeria, Libya, and Afghanistan, and other countries, are operating in the Sinai Peninsula. Ali’s comments were issued about two weeks after he said that Egyptian security forces had killed 60 militants in the Sinai since the ouster of Mohammed Morsi in early July. 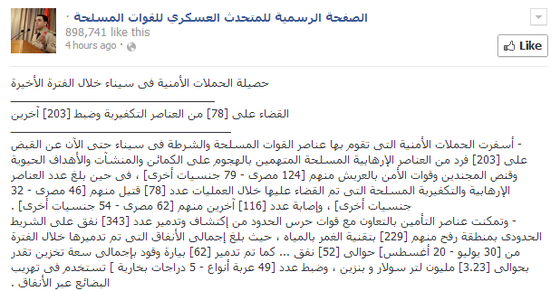 And just last week, more than 20 Egyptian policemen were executed by Islamist militants in the Sinai. No group has taken credit for the attack. The army spokesman’s comments also come a day after the militant group al Salafiyya al Jihadiyya in Sinai released a statement, which was obtained and translated by the SITE Intelligence Group, calling on Muslims to fight the “apostate” Egyptian army. “It was a scene the likes of which you will almost never find, except in the Crusader wars,” the statement said. The group then listed a litany of “crimes” by security forces, including the siege on the al Fateh Mosque. “Fighting it has become an obligation to repulse the aggressor who attacks the lives, possessions, and honor of Muslims. They must be fought until they stop their harm stop standing being between the people and God’s law,” the statement continued. The jihadist group, which issued a statement in November 2012 questioning why the army did not fight Israel during Operation Pillar of Defense, used the recent statement to urge security personnel with “an iota of faith or morality” to leave their organizations or else face the potential of being targeted. “Religion was lost because of this approach,” the group said. The statement urged Egyptian Muslims to adopt “jihad, the apotheosis of religion,” in order to protect fellow Muslims and defend Islam. “The apostates, the Crusaders, the secularists, and the atheists have raised their banner in a war against Islam. The ranks of the people of faith are now coming together to raise the pure banner of Islam, the banner of ‘there is no god but God.’ Be of the supports of Allah,” it concluded. The statement from al Salafiyya al Jihadiyya is the latest in a plethora of statements from jihadists in response to the ongoing crackdown on the Muslim Brotherhood. Announcing attacks before you carry them out seems to be silly unless you just want attention. Of course the kind of attention you may get can be lethal as the Egyptian Army has shown. assasinated? A likely scenario with a Pakistani feel around it. Same kind of split and radicalism among low level officers. I fear that the world/civilization is soon heading into a live or die confrontation with radical Islam. Moderate Muslims in these certain contries will go along with what their Govt. does. And when “they” get nukes, then what? We and allies are condemned either for fighting back OR not submitting. Either way, it is bad news. You can say that again, Talha Khan.